This is a close-up from the new footbridge, showing the curves that really aren’t that noticeable when you look at it head-on. This entry was posted on June 25, 2009 at 12:01 am	and is filed under Uncategorized. Tagged: bridge, Clyde, Glasgow, reflection. You can follow any responses to this entry through the RSS 2.0 feed. Both comments and pings are currently closed. I like the way you’ve composed this Jackie. Wow, what a terrific new bridge where art and functionality meet!! Beautiful shot…the water is SO still, it almost looks fake!!! It looks great! I like your angle and composition of colours! I wonder Jackie if you’ve “done the Squiggly” yet? It does look tempting when you’ve had a few! 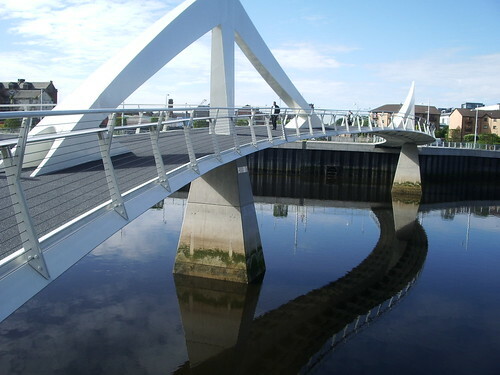 Lovely bridge, looks like it has sails. Fantastic! A new reason to come and visit Glasgow. Thanks, Jackie. Ciao. A. @ Scott: now you’ve got me worried that I’ve inadvertently and innocently stumbled on a Scottish euphemism!